Jack White’s debut album is coming out soon so it’s obviously time to do a career retrospective with a Jack White edition of the Guitar Riffs for Ukulele series. I’ve already covered his most famous riff – Seven Nation Army – but there’s plenty more where that came from. Two great riffs in this tune. The main chord riff above and the single note riff below (which you need to play a lot higher than the original to stay in the same key). When you play the A chord in the riff make sure you do it with your middle and ring fingers so you can bring your index finger under it to slide into the B chord. 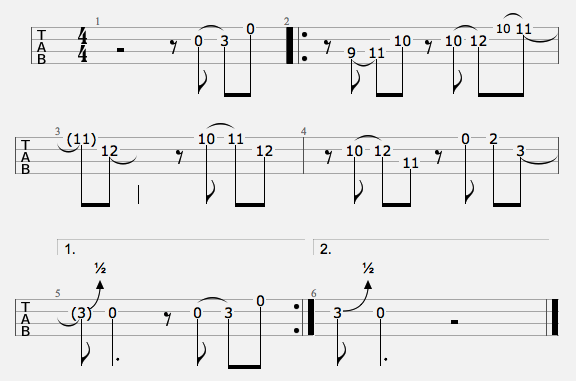 This is a version of the riff that crops up at the 47 second mark in the video. It’s not in the original key. Isn’t Alison Mosshart just fantastic? Anyway, I played this one bass guitar picking style. But it’s a good excuse for using a pick too. Third Man Records – Jack White’s record label – have put out so much great stuff. Often with Jack providing some wild guitar accompaniment to the artist’s usual sound. My favourite of these is the one he did with the Secret Sisters but this new one with Tom Jones comes very close. This riff kicks in at 40 seconds.